Add this issue to your photographic library for information on the Canon EOS 500D, Speedlite 270EX, TS-E 17mm f4L and TS-E f3.5L II tilt-and-shift lenses. Plus techniques on depth-of-field, dealing with camera shake if you can't stretch to an IS lens, GPS devices and multiple flash. 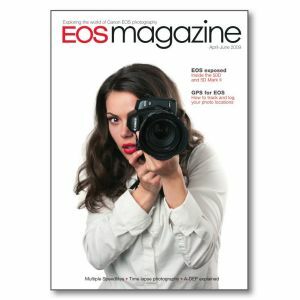 New products EOS 500D; Speedlite 270EX; TS-E 17mm f/4L & TS-E 24mm f/3.5L II tilt-and-shift lenses. Professional showcase Steve Hanson photographs both the dynamism of dance and the dramatic landscape of the British Isles. Hidden depths Do you think about depth-of-field before taking a photograph? If so, how do you determine the aperture you need? We take a look at a shooting mode that does all the work for you. IS alternatives Canon’s image stabilising lenses might not be available in the focal length range you need, or might not fit your budget. Craig Roberts looks at other ways to overcome the effects of camera shake. How was it shot? Determined to shoot dynamic cycling images, Jordan Weeks has tried photographing from various unusual viewpoints. Here, he uses an invaluable camera accessory and slow shutter speeds. EOS exposed The EOS 5D Mark II and EOS 50D were announced in Canon’s Autumn 2008 Collection and are now available. We investigate some of the interesting features of each model. Multiple flash A single Speedlite can give good results but – as the famous saying has it – two heads are better than one. Gerard Maas provides the pictures which prove the point. Passing the time You don’t need a movie mode on your EOS camera to create fascinating film clips. We show you how time-lapse photography can be used to produce imaginative moving pictures. Where in the world With the latest GPS devices it is possible to pinpoint the exact location where a photo was taken. Andrew Gibson guides you through the world of GPS and geotagging. DPP with JPEGs Photographers who shoot in JPEG can lose out on the full potential offered by the RAW format. But Canon’s Digital Photo Professional software offers editing options for JPEG files too.